Origin and Habitat: Gasteria brachyphylla is widely distributed in the Little Karoo south of the Swartberg and northwards to Willowmore. Western Cape of South Africa. Altitude range: It is found at elevations of up to 1000 metres above sea level. Habitat and ecology: Succulent Karoo, spring flowering. It occurs in flat to mountainous terrain usually in shade of dwarf shrubs interspersed with taller shrubs. Accompanying species can be Quaqua ramosa, Antimima pygmea, Pelargonium laxum, and gibbaeums. It grows mainly on shales and sandstones. The soils are sandy and well drained and the pH varies between 4,7 (in sandstone) and 7,6 (in shale). The climate is hot and dry and when frost occurs it is mild. Rainfall, ranging between 200 and 300 mm per year, occurs in summer and winter but with a tendency to summer dryness. Gasteria brachyphylla is widespread and is not threatened in its habitat. Description: Gasteria brachyphylla is a stemless, decumbent to erect solid looking succulent plant, 9-23 cm tall and 7-23 cm across, with opposite fleshy, strap-like leaves arranged in a single line (distichous). The smooth surfaces of the leaves are marked with many white spots, in bands or randomly distributed. It branches from the base to form small groups. It forms elongated racemes with pinkish flowers. The varieties are distinguished by length and apex of the distichous leaves. var. brachyphylla (G. angustianum, G. triebneriana, G. joubertii, G. vlaaktensis) and var. bayeri. The smooth shiny leaves distinguish Gasteria brachyphylla from the related Gasteria disticha which grows in the Robertson Karoo and has a rough leaf surface (almost like fine sandpaper, termed asperulous). Derivation of speciefic name: The specific Greek epithet 'brachyphylla' means short-leaved (“brachy” = abbreviated or short and “phyllon”, leaf). Roots: Succulent, up to 5 mm in diameter. Leaves: Distichous, strap-like, rarely triangular-lanceolate. The inner leaves are erect, becoming spreading. The upper surface is convex to flat and the lower surface is flat. The epidermis is smooth, dark green, both faces densely spotted, with dense white spots arranged in obscure transverse bands. The margin are crenulate, becoming continuous towards tip, leathery white and with small rounded teeth, with an acute apex (sometimes obtuse or truncate), up to 1.5-23 cm long, 2.2 - 8 cm wide. Juvenile leaves lorate, rough to the touch, densely spotted, obtuse. Inflorescence (raceme): 0.2 - 1.1 metres tall, simple or with a pair of side branches. Pedicels 5-7 mm long. Flowers: Small, globose to globose-elliptic. Perianth 12 - 22 mm in diameter, borne on the end of a stipe (stalk) 2 - 3 mm long, gasteriform part half of perianth length, pink, 5-7 mm across, globose or globose-ellipsoid, then constricted into a tube 3-4 mm in diameter, white with green striations. Style 7-10 mm, included. The stamens do not protrude. Blooming season: Spring (in habitat July–February, but mostly during September ). Fruits (capsules): Oblong, 15 -23 x 7 mm. Seeds: Flattish, black, 3 - 4 x 2 - 3 mm. Gasteria brachyphylla (Salm-Dyck) van Jaarsv. : (var. brachyphylla) has leaves 90–230 mm long, 30–80 mm wide with a pointed leaf tip. Distribution: Little Karoo south of the Swartberg and northwards to Willowmore. Gasteria brachyphylla var. bayeri van Jaarsv. : smaller, leaves only 15-50 mm long, with truncated leaf-ends. Inflorescence to 28 cm long and the flowers (perianth 18 mm) large for such a small plant. Distribution: Little Karoo, near Ladismith and Calitzdorp. Gasteria nigricans var. marmorata f. variegata: has fat coriaceus leaves striped with ridged surface of gray-silver and ivory. 3) Van Jaarsveld, E.J. 1994. "Gasterias of South Africa." Fernwood Press, Cape Town. 4) Van Jaarsveld, E.J. 2007. "The genus Gasteria, a synoptic review." Aloe 44: 4: 84–103. 7) Raimondo, D., von Staden, L., Foden, W., Victor, J.E., Helme, N.A., Turner, R.C., Kamundi, D.A. and Manyama, P.A. 2009. “Red List of South African Plants.” Strelitzia 25. South African National Biodiversity Institute, Pretoria. 9) Aiton, W. 1789. "Hortus Kewensis", edn 1. Nicol, London. 10) Gunn, M. & Codd, L.E. "Botanical exploration of southern Africa". Balkema, Cape Town. 11) Mucina, L. & Rutherford, M.C. (eds) 2006. "The vegetation of South Africa, Lesotho and Swaziland." Strelitzia 19. South African National Biodiversity Institute, Pretoria. 12) Wijnands, O. 1983. "The Botany of the Commelins". Balkema, Rotterdam. Cultivation and Propagation: They are of easy culture and can grow easily on window sills, verandas and in miniature succulent gardens where they are happy to share their habitat with other smaller succulent plants, or in outdoor rockeries. Growth rate: They are relatively fast-growing plants that offsets freely to form small clusters quickly. Soil: It is tolerant of a wide range of soils and habitats, but prefers a very porous potting mix to increase drainage. A non-acid soil is ideal. You can grow a plant in a 10-15 cm pot for years and have perfectly happy plants. For best results, use a shallow pot. Exposure: Need light shade to shade, but will take full sun part of the day. (with some sun exposure the leaf develops a nice reddish tint and remain compact) During the hot summer months, the soil should be kept moist but not overly wet. Hardiness: During the winter months, water only when the soil becomes completely dry. Frost hardy to -1°C (Or less). 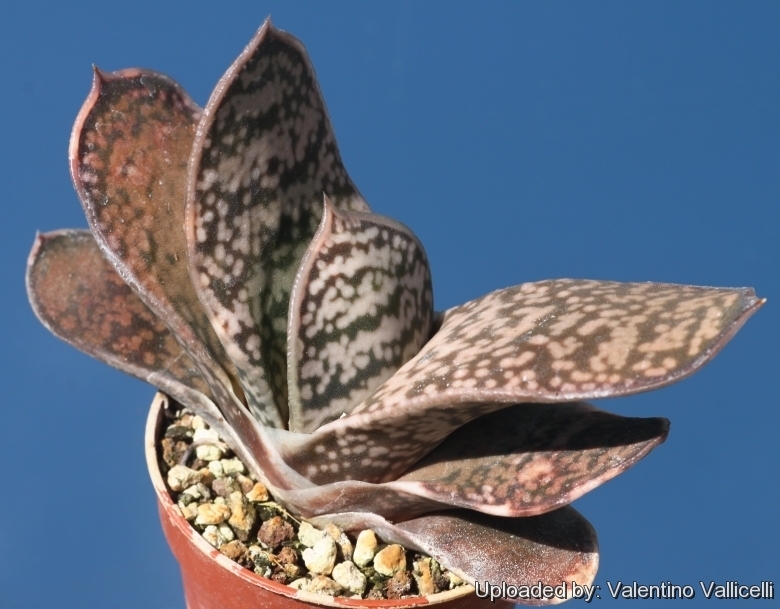 Pest and diseases: Rot is only a minor problem with Gasteria if the plants are watered and “aired” correctly. If they are not, fungicides won't help all that much. Incorrect watering, poor drainage or too much shade can lead to attack by pests and diseases. Care must be given in watering, keeping them warm and wet while growing, and cooler and dry when dormant. Remarks: Gasterias are best planted in a shaded and airy part of the greenhouse, and not too close to the glass roof or sides of the house as the plants can overheat during hot spells. Propagation: Gasterias are easily propagated by the removal of offshoots or by leaf cuttings in spring or summer. To propagate by leaf cuttings, remove a leaf and let it lie for about one month, giving the wound time to heal. Then lay the leaf on its side with the basal part buried in the soil. This leaf should root within a month or two, and small plants will form at the leaf base. They can also grown from seed.